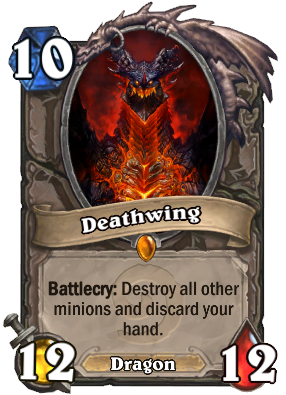 Deathwing was Hearthstone’s original Hail Mary card. When you slam the leader of the black dragonflight on the board he destroys every minion in play and discards all the remaining cards in your hand. Either your opponent has no answer to his 12/12 stats and you close out the game soon after, or the big dragon eats a hard removal spell like Hex and you weep tears of molten lava. Either way, dropping Deathwing always feels baller. Unfortunately, until now it didn’t look quite as amazing as it felt. Deathwing has been around since the days of vanilla Hearthstone, and the card’s original animation used the same generic fiery effect employed for cards like Wild Pyromancer and Doomsayer. Not bad, but nothing special. For some time fans have been asking Blizzard to update Deathwing’s intro to bring it in line with other spectacular legendaries, something the developer has done for cards like Lord Jaraxxus, whose hero power got a fresh new look not long ago. With yesterday’s quality of life patch, which added the ability to copy decks and complete quests against friends, Blizzard also updated the animations of Deathwing and, somewhat less spectacularly, the skeletal wizard Bloodmage Thalnos. The star of the show is definitely the big dragon, who now gloriously swoops across the board unleashing hot death before nuking your hand and swooping down into play. Positively badass, and for once Reddit was happy, as the reaction thread shows.